The Top Secret Area can be accessed by unlocking the secret exit in the Donut Ghost House. The Top Secret Area contains 5 ? blocks. The two on the left contain Fire Flowers while the two on the right have Feathers. The middle ? block contains Yoshi. As with all other boxes in the game, hitting the Feather or Flower boxes while small will yield a Mushroom and hitting the Yoshi box when you have a Yoshi will yield a 1-up mushroom. 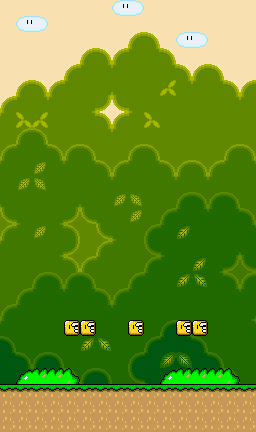 This is a great area to accumulate on 1-ups and power-ups, especially when preparing for difficult levels. If you've touched a checkpoint tape in another level, it will be saved no matter how many times you enter and exit this level, so it's a great way to make tough levels easy or somewhat easy. When you leave this level in 2-Player mode, it's still your turn! This page has been accessed 43,239 times.